We were delighted to be approached by Getmade Design to help with a project that they were working on to illuminate bicycles for Ghost Peloton. Ghost Peloton is a collaboration between NVA and Leeds based Phoenix Dance Theatre, in partnership with Sustrans. It has been created for the Yorkshire Festival 2014, marking the build-up to the Grand Départ, with the opening two stages of the Tour de France coming to British shores this summer. 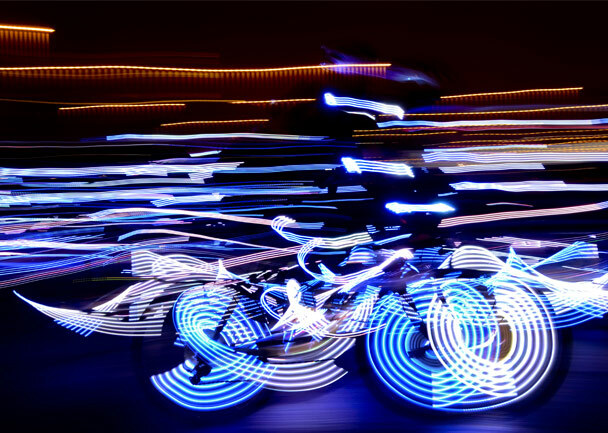 We supplied over 400 metres of Bright Green RGB LED tape to Getmade Design who then developed a bespoke system to illuminate the bikes, allowing the colour, flash rate and luminosity to be controlled. See a video of the riders in action on the BBC News Leeds & West Yorkshire Website.